Mount Bulusan, or Bulusan Volcano, is the southernmost volcano on Luzon Island in the Republic of the Philippines. It is situated in the province of Sorsogon in the Bicol region, 70 km (43 mi) southeast of Mayon Volcano and approximately 600 km (370 mi) southeast of the Philippine capital of Manila. It is one of the active volcanoes in the Philippines. Bulusan is classified by volcanologists as a stratovolcano (or a composite cone) and covers the northeast rim of Irosin caldera that was formed about 40,000 years ago. It has a peak elevation of 1,565 m (5,135 ft) above sea level with a base diameter of 15 km (9.3 mi). Located around the mountain are four craters and four hot springs. The first crater, called Blackbird Lake, is 20 m (66 ft) in diameter and 15 m (49 ft) deep. The second crater is oval, with dimensions of 60 by 30 m (197 by 98 ft) and 15 m (49 ft). The third crater is about 90 m (300 ft) in diameter and 20 m (66 ft) deep, while the fourth, which is near the northeastern rim opened during the 1981 eruption. There is also a 100-metre (330 ft) fissure measuring 5 to 8 m (16 to 26 ft) wide below this crater. Its hot springs are San Benon Springs, Mapaso Springs, San Vicente Springs, Masacrot Springs. Its adjacent volcanic edifices are Mt. Homahan, Mt. Binitacan, Mt. Batuan, Mt. Calungalan, Mt. Calaunan, Mt. Tabon-Tabon, Mt. Juban, and Mt. Jormajan. Bulusan is generally known for its sudden steam-driven or phreatic explosions. It has erupted 15 times since 1885 and is considered as the 4th most active volcano in the Philippines after Mayon, Taal, and Kanlaon. There are evacuation procedures in place for parts of the peninsula; the farms nearest the volcano are to be evacuated, and many of the village schools will be closed if it is considered possible that a more destructive eruption could occur. The Philippine Institute of Volcanology and Seismology (PHIVOLCS) declared Alert Level 1 on March 19, 2006 after it recorded increased seismic unrest. On June 8, 2006, volcanologists raised the Alert Level to 2 (moderate level of seismic unrest) after it spewed ash. On June 9, the resulting ash cloud damaged a number of houses in the nearby town of Casiguran, 5 kilometers (3.1 mi) north of the volcano, and reached Sorsogon City, about 20 kilometers (12 mi) north of Bulusan. Following some signs of volcanic activity, on the morning of July 31, 2007, 9.37 AM (local time), there was a loud explosion described by locals as "like a bomb going off". A cloud of steam and ash shot into the air from Mount Bulusan to a height of 5 kilometers (3.1 mi), drifted and deposited over the surrounding countryside. The eruption lasted for 20 minutes. On October 4, 2007, two episodes of ash explosions occurred as recorded by the seismic network. The explosions were not visually observed due to thick clouds covering the volcano's summit. The events were recorded as explosion type-earthquakes at 1:34 AM and 1:39 AM. The seismic network recorded 40 volcanic earthquakes and 8 short duration harmonic tremors during the previous 24 hours. Ground deformation surveys along the Inlagadian leveling line at the northeast flank indicated a slight inflation of the volcano's edifice. Field investigation conducted showed trace to light ashfalls affecting barangays San Roque, San Rafael, Sitio Tawog of Porog, Porog proper and Bulusan town proper, all in the municipality of Bulusan. On November 7, 2010, PHIVOLCS recorded increased seismic activity at Bulusan Volcano, 24 hours after the active volcano spewed a 600-meter (2,000 ft) ash column and grayish steam on November 5, 2010. State volcanologists noted that at least 10 volcanic earthquakes and four explosion-type events have been documented subsequent to the emission of ash and steam at 8 a.m. on Saturday (5 November 2010). PHIVOLCS also noted that steaming activity was characterized by strong emission of white steam column that reached a maximum height of 200 meters above the crater rim. It warned the public not to enter the four-kilometer permanent danger zone from the volcano. People residing near the valleys and streams were also advised to be "extra alert" against sediment-laden stream flows in the event of heavy rains. More ash ejection were reported on November 8–9, 2010 with ash fall on areas in Juban and Irosin towns in Sorsogon province. A PHIVOLCS bulletin on November 9, 2010 stated that eight volcanic earthquakes were recorded from the volcano during the past 24 hours and weak to moderate emission of ash explosion was observed. PHIVOLCS also warned residents near valleys and streams against sediment-laden stream flows in the event of heavy and continuous rainfall. After months of little activity, the volcano suddenly erupted and sent a plume of ash 2 kilometers (1.2 mi) high, after water reacted with the hot magma. PHIVOLCS has said such explosions are likely to continue for the coming weeks. Initially, hundreds of nearby residents evacuated on their own, but the government has stepped in to evacuate thousands more, and imposed a 4-kilometer (2.5 mi) travel ban around the crater. They also advised aeroplanes to avoid the immediate perimeter due to ash and debris in the air. In July 13, 2014, during the 24-hour observation period, the seismic network detected thirteen volcanic earthquakes. Mount Bulusan ejected a 250 m (820 ft) ash plume in May 1, 2015 at around 9:46 PM, lasting for 3.5 minutes. The incident is classified as a "minor explosion event" by PHIVOLCS leading to the raising of Alert Level 1 (abnormal activity) for the surrounding area. A second ash explosion lasting for five minutes also occurred on the same day. PHIVOLCS determined the cause of the eruptions to be hydrothermal activity beneath the volcano. People were advised not to enter the 4 km (2.5 mi) Permanent Danger Zone. Further advisories were given to low-flying aircraft against the dangers of sudden phreatic eruptions, and to local residents near rivers and streams in case of lahar flows. There were also concerns that rains from Typhoon Noul could trigger lahars and mudslides near the mountain. However, after Noul recurved to the north, the threat did not materialize and the evacuees were permitted to return to their homes. On June 16, Mount Bulusan generated two volcanic eruptions with the first one recorded at 11:02 AM which lasted for 10 minutes producing a one kilometer high grayish steam and ash plume and accompanied by rumbling sounds. The second one was recorded at 11:20 AM which lasted for a minute producing only a small ash plume. On June 18, the volcano once again erupted but was not observed visually due to thick clouds covering the summit. Prior to the eruption, rumbling sounds was heard between 5:00 AM to 7:00 AM by residents of the village of Monbon in Irosin town. The next day, June 19, Bulusan erupted yet again at around 2:55 PM producing a 1.5 kilometer high ash plume. On June 10, almost a year after its last eruption, Mount Bulusan erupted again at 11:35 AM. The eruption lasted for five minutes and generated an ash plume measuring 6,562 feet or some 2,000 meters. According to PHIVOLCS, the eruption was phreatic in nature and had a shallow source, with the ash drifting northwest to the direction of Juban town. While the PHIVOLCS did not raise the alert level 1 in the volcano, it advised residents not to enter the four-kilometer Permanent Danger Zone and warned pilots not to fly near the volcano. On December 29, Mount Bulusan had a phreatic eruption, shooting a plume of ash about two kilometers high. It happened 2:40 pm local time and lasted for about 16-minutes. The eruption prompted PHILVOLCS to raise Alert level 1 for the surrounding areas and remind the public not to enter the 4-kilometer radius Permanent Danger Zone. ^ a b "Bulusan". Global Volcanism Program. Smithsonian Institution. Retrieved 2006-06-12. ^ "Bulusan Volcano, Philippines". Peakbagger.com. Retrieved 2014-05-03. ^ "Philippines Mountains". Peaklist.org. Retrieved 2014-05-03. ^ "Easter Sunday alert: Bulusan explodes; Taal acting up, too". GMANews.TV. ^ "Bulusan eruption 2007's 25th, big bang possible". The Manila Times. Archived from the original on 2007-10-20. Retrieved 2007-08-01. ^ "Mt. Bulusan acting up". Retrieved July 13, 2014. ^ Mangosing, Frances. "Bulusan 'abnormal;' Alert Level 1 up — Phivolcs". Inquirer. Retrieved May 7, 2015. ^ Amo, Cesar. "Phivolcs sends team to Bulusan". PhilStar. Archived from the original on 2015-05-08. Retrieved May 7, 2015. ^ Geronga, Jean Rose. "Alert Level 1: Mount Bulusan spews 250-meter ash plume". CNN Philippines. Retrieved May 7, 2015. ^ "Typhoon Noul: Philippines evacuates residents threatened by typhoon, volcano". ABC News. May 8, 2015. Retrieved May 11, 2015. ^ "Typhoon intensifies as it zeroes in on northern tip of Philippines; 1,400 evacuated". US News & World Report. May 10, 2015. Retrieved May 11, 2015. ^ "Bulusan Volcano ejects ashes anew; classes suspended in two towns". Archived from the original on 2015-06-21. Retrieved June 21, 2015. ^ "Bulusan blows top anew, sends 1.5-km ash column". Retrieved June 21, 2015. ^ Gepuela, Lou (10 June 2016). "Mount Bulusan erupts". Rappler. Retrieved 16 June 2016. ^ Luces, Nico (10 June 2016). "Mt. Bulusan spews ashes anew". Manila Bulletin. Retrieved 16 June 2016. ^ "Bulusan Volcano in Sorsogon erupts". CNN Philippines. 10 June 2016. Retrieved 16 June 2016. ^ "LOOK: Bulusan spews 2000-meter ash column". ABS-CBN News. 29 December 2016. ^ "Bulusan Volcano Alert Signals". 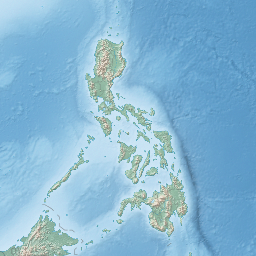 Wikimedia Commons has media related to Mount Bulusan. "Bulusan". Global Volcanism Program. Smithsonian Institution.